PANTS ON FIRE! - D.C. Thomson & Co. Ltd.
May 2017, with the General Election a few days away, the nation’s political outcome is a talking point across the country and it’s not just those of voting age that want to have their say. Beano Studios, the experts in all things trending with kids, have polled their audience and conducted research1 into what the children of Britain (aged 6-12 years old) really think about the upcoming election, politicians and even Brexit. Research carried out by Beano Studios revealed that nearly half of kids (40%) think that politicians are “more likely to lie” than other professions. More so than business people, celebrities and even their teachers! Kids were also asked why they thought politicians might tell a lie and a whopping 51% believed it was ‘to get their own way’, so it’s not surprising that when asked ‘what would you most like to be when you grow up?’ Prime Minister came bottom of the table. Becoming a footballer is the top scoring career choice for boys, and a YouTuber is the dream job for most girls. Sorry Theresa May! Beano, synonymous with everyday rebellion for kids everywhere, is well versed with mocking generations of political leaders, celebrities and the like, and this election is no different. 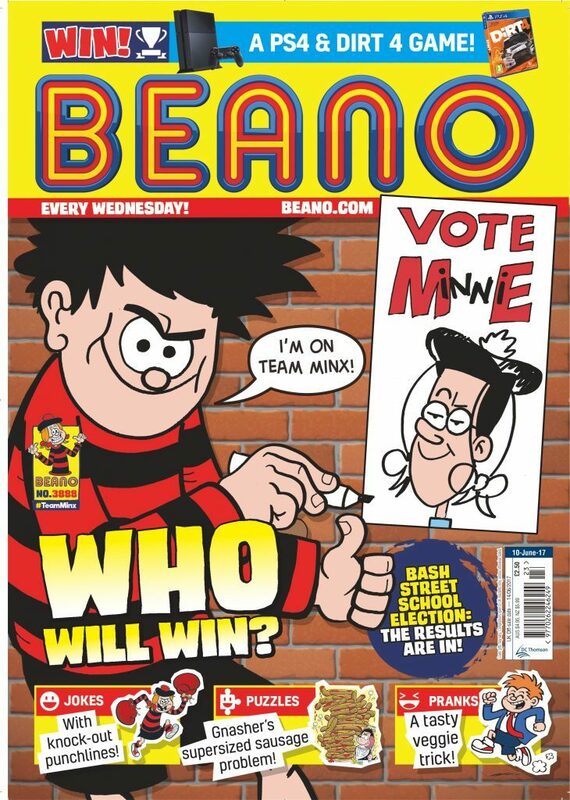 The eponymous Beano comic has been running a three part election storyline over the last few weeks, pitting the villainous Walter against the girl who’s tougher than all the boys, Minnie the Minx, in a battle to win the school’s election for class president in Beanotown. The story will culminate this week with Minnie the Minx winning the vote over Walter and being crowned class president in the comic’s own election race. Drone racing to be made a national event! National minimum pocket money of £5 a day! No stairs in homes, only slides! Transport by hover board for all! And in a surprise wake up for British politicians, it’s worth knowing that Donald Trump is more recognisable to kids of Britain than their own Prime Minister, with over two thirds (68%) recognising him as a political figure in a list that included the leaders of the UK’s own political parties. Check out www.beano.com now for your daily feed of fun. Research carried out by Beano Studios via One Poll 2017. Survey of 1,000 British children between 6 – 12 years old. Our own Prime Minister Theresa May was the most recognised politician from the UK with 65% of kids knowing she is in politics. Other politicians in the line-up included Jeremy Corbyn who, interestingly as the leader of the opposition, is as equally recognised as a politician by kids as current Foreign Secretary Boris Johnson and former US president Barrack Obama. 39% recognise each of them. Perhaps it’s their understanding of political issues that gives kids the urge to have their say in the coming election. Half of kids think that the voting age should be lowered to 16 or under. Another hot topic for British children, in the run up to the election is still, Brexit. It appears British kids are far more clued up on what the means for the future of the country than you might expect. Nearly two thirds of children know what Brexit means and nearly half of those surveyed can specifically identify that as a result, Britain will leave the EU.